Blue_7_Coin_Envelopes_-_3_12_x_6_12 is rated 5.0 out of 5 by 1. Rated 5 out of 5 by Pkhoury from Great envelopes I ordered the large coin envelopes in the black and baby blue. The quality and colors are perfect!! What is the lead time on these envelopes? Do you have them in stock? Where do they ship from? Hello. Yes we have these in stock. The lead time depends on where you are located. We ship all orders same day from Northvale, New Jersey. If you are shipping to Maryland, you can expect your order within 1-2 business days. Please let us know if you have any additional questions! Hello, Are the #7 coin envelopes mailable? Not sure what color envelope to purchase? How about flipping a coin? And afterwards you can take that coin and place it right in this cool Blue #7 Coin Envelope. Blue 3 1/2 x 6 1/2 #7 Coin Envelopes are perfect for storing small knick-knacks, notes, and of course coins (nowadays called money). Often used by those in the tip-receiving industry to keep their earnings for the day, these envelopes are certain to stand out and be easy to spot if you accidentally misplace it. You can even use these to make a bright cover for gift cards or money for birthdays, baby showers, graduations, and more! 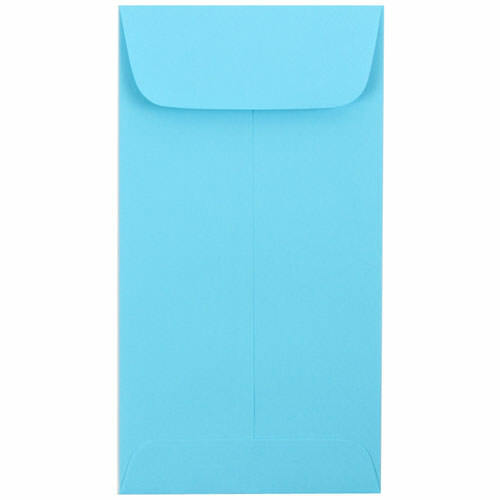 Blue #7 Coin Envelopes measure in at 3 1/2 x 6 1/2 inches and feature a short rectangular gummed flap sure to keep your money (or other trinkets) secure. Available in Blue Recycled (with 30% Recycled content) and Baby Blue. Each shade comes in a pack of 25 so you can always have some to give away or store away!